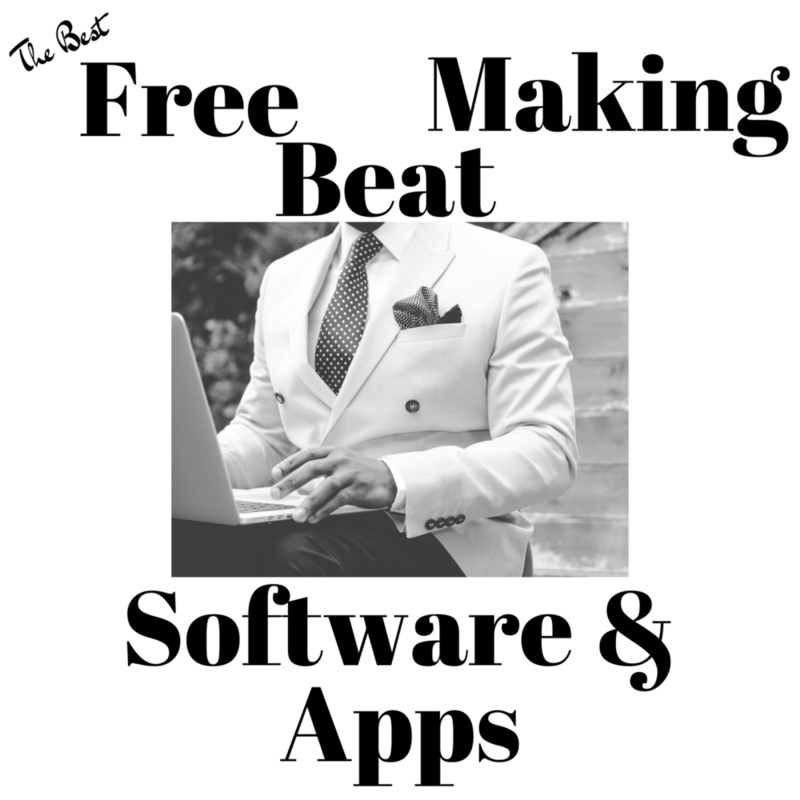 If you are looking for a free online beat maker in 2019, here is a list of the best software available. Composers, songwriters, and music producers will all find a use for the tools below. They include apps, sequencers, and online drum pads for making hip hop, rap, trap, dubstep and more -- representing the ultimate free music creator software on the internet today. Whether you are on a budget, new to recording, or a professional looking for fun drum kits, these programs will help inspire you. In most cases, music creators can use their computer keyboard or MIDI controller to trigger a drum sample, set, or pads. The sequencers are just as simple, and only need a mouse to start turning your computer into a virtual online drum machine. Music Maker (Free) is popular music making software that comes with 425 sounds and loops. It is simple to use and great for making beats. Producing EDM is also easy with the included soundpools (1,927 sounds and loops). The free version of Music Maker by MAGIX allows 8 tracks, 8 effects, and 3 software instruments. This starter pack offers enough features to start making tunes right away, ranking it among the best free beat making software. Songwriters and producers who want more audio tracks and tools can upgrade for a minimal fee. Music Maker 2019 Plus Edition and Music Maker 2019 Premium Edition are both under $100! Beat makers who want to try it out can always start with Music Maker Free. 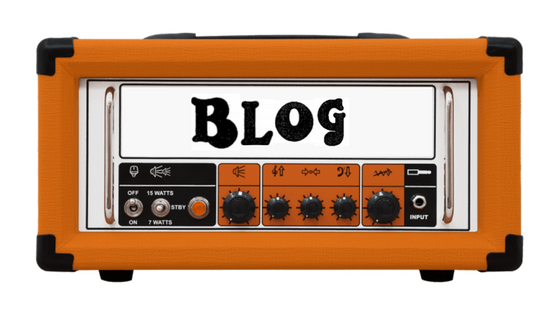 It's the easiest way to write, produce, and record music for free. Sampulator is a foxy looking online beat maker that plays in your browser. All music makers and producers need to do is press "Shift" to record and start banging away. It works on Mac and PC, and projects can be saved by logging in to Twitter. The built in drum sounds on the sequencer are great for hip hop and rap beats. If producers need a different kick or snare, the Sampulator Shop sells add-ons like 808 samples and keys, along with a free vocals, percussion, and OG one shots. Aesthetically, it is a bit like Native Instruments Maschine, but there's no download and everything plays online in your browser. Fun! 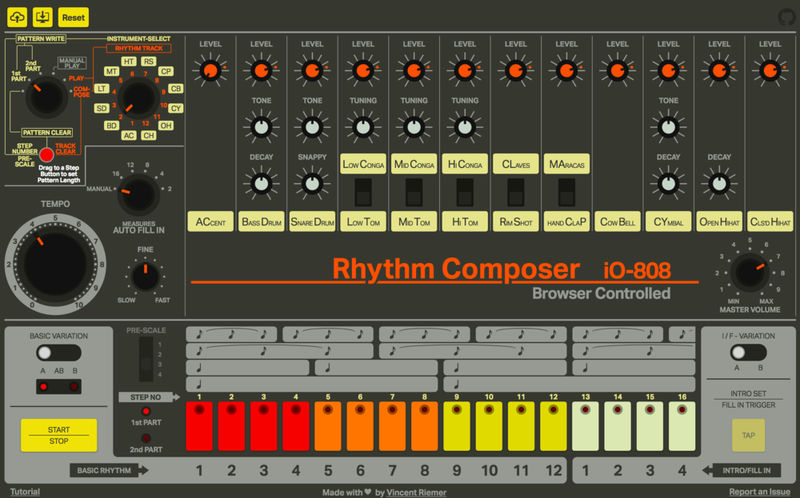 The Rhythm Composer iO-808 is a web-based Roland TR-808 drum machine emulator that works in your browser with no download necessary. The developer admits the graphic interface is difficult to understand if you are unfamiliar with 808 hardware, but he has included a simple set of instructions for future beat makers. Cool free option for sure, and the accurate GUI makes it an attractive online 808 drum machine. Hardware fans who don't want to pay over $3,000 for a vintage TR-808 should check out the affordable Roland TR-08 Rhythm Composer. Hydrogen is an open source drum machine program for Mac, PC, and Linux. It is free beat making software that offers a great pattern-based sequencer and sample editor for music producers. Files can be imported and song projects can be exported as midi or audio. This is a useful tool for composers and producers who want to tweak their beats in a DAW (digital audio workstation). The GUI is not flashy, but it is easy to navigate and helps artists write and record music without technical interference. Hydrogen Drum Machine is awesome free music-making software for beginners and pros on a budget. Novation Launchpad Arcade in an online player that lets you remix songs in your browser. DJs, rap, hip hop, and dance music producers will enjoy passing the time with this beat maker. It is a great way to learn making music with loops and one shot samples. Launchpad Arcade can be triggered with your phone, computer keyboard, or Novation Launchpad hardware. It works on your iOs or Android device, Mac or PC. FL Studio is a great introduction to music production software, and a popular choice for beat makers. The best part is that it's free to download for both Mac and PC. The free version of FL Studio has no time limit, but songwriters and producers will find it is a "lite" version and can be upgraded to "Fruity" or "Producer" editions to start accessing more vst plugins and features. Popular beat makers and DJs who made music with FL Studio: Afrojack, Deadmau5, Avicii, Martin Garrix, Porter Robinson, Madeon, and 9th Wonder. MuseScore is free and open source music notation software for Mac and PC. Beat makers will enjoy composing percussion, strings, and guitar tabs with ease. You can write in the notes, or use a midi controller and MuseScore will automatically write the music. This is awesome for producers who want to write sheet music for studio musicians. Want to record real strings, guitar, or drums? Beat makers can easily create and print parts for studio sessions with collaborators. A minimal understanding of reading and writing music is needed, and it's free to play around with. Composers and songwriters might recognize this approach to musical notation from popular software like Sibelius and Finale. MuseScore offers a paid upgrade version, but the free software has many useful features to start writing and producing songs. The MuseScore Songbook app is also available for download at a minimal cost. Songbook lets composers plan and practice sheet music at home or on the go, complimenting the computer software. The app available for iOs (iPhone and iPad) and Android devices. Mixxx is extremely popular free music and beat making software. 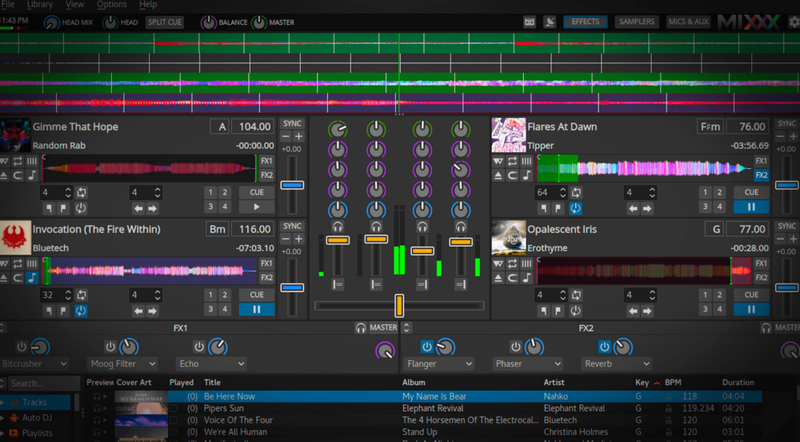 It is an especially useful production tool for DJs, and is available for download on Mac and PC. For free music software it comes packed with useful features, like four decks, pitch and key control, beat looping, master sync, hotcues, quantization, and more. As far as free music production and beat making software goes, MIXXX is an attractive and effective option. It is a big help with beatmatching and, in addition to recording, it is a useful mixing tool for radio stations, podcasts, and live broadcast. Professional producers, DJs, and beat makers often use music software like Traktor by Native Instruments or Serato, but Mixxx is certainly a popular contender and can be downloaded free here. Hammerhead Rythym Station is not the prettiest, but it's free beat making software that makes drum patterns quick and easy. It is a standalone online drum machine that can be downloaded for Windows (No Mac at this time, unfortunately). It comes with 29 drum samples for dance, hip hop, electronic music, and more. Beats are easy to make and mix with minimal tweaking. Audio files can then be exported for further music production in any DAW. The interface looks like it belongs in a floppy disc storage room, but music makers can get creative and write hit songs with this free online software. Okay, Splice is not totally "free." It is free to try for 14 days though, and dirt cheap for what it offers: millions of royalty free samples to create and produce music with. Songwriters, beat makers, and DJs have access to song starters, loops, sounds, drum hits, synths, and one shots galore. The Splice Beat Maker is as easy on the the eyes as it is to use. With a simple interface, Beat Maker utilizes all the modern and future technology of songwriting and music production software. A-list creators, DJs, and electronic dance music producers like Deadmau5, Jauz, and KSHMR are users and contributors to Splice. Fat kicks, gritty snares, wide synths, and all the radio-ready sounds are there to build your beat. 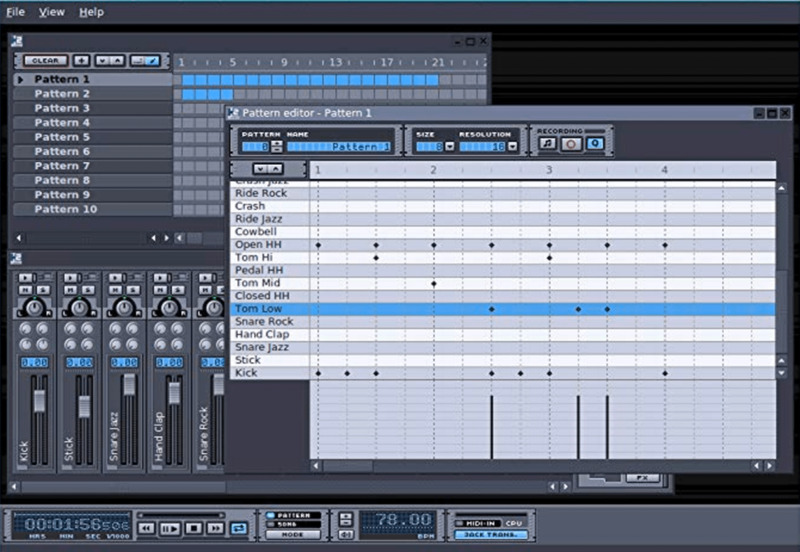 Ordrumbox is free drum machine software for making music and beats. Producers can import and create their own drum kits, and it's easy to bring in or bounce midi files for use in a preferred workstation. A sequencer and mixer is available, along with auto-composition, a custom arpeggiator, automatic sounds/track matching, and custom soft synths. Adding to this is a library of rhythms and sounds, as well as customized synths. Ordrumbox provides beat makers and producers a lot of features for free, and the software can be downloaded on Mac or PC. DrumFlow looks like it went on a date with a floppy disk, but it makes beats for free. Unfortunately, it is only available for PC Windows users (some claim there are Mac downloads out there, so please comment below if you find). It is promoted as an "ideal way to create MIDI drumloops" and is indeed a powerful free drum sequencer. Experienced beat makers might find more options in other online software, but DrumFlow definitely has its uses for creating songs and working with midi -- especially for beginner and budget-minded songwriters and producers. Garageband makes up for all the PC software love above. It is the best in-the-box music studio offered for free on Mac/Apple devices, and the perfect way for songwriters to learn arranging and recording songs. The price can't be beat, and even a chimpanzee can figure out how to press the record button to begin tracking. There is also expansive drum software built in, allowing midi to be drawn in or triggered from your keyboard or mobile device. Beat makers without a DAW can nab this and get going right away. The Drumbit Online Drum Machine is a simple and easy to use drum machine. Just click on the buttons you want to trigger, and press play. If you come up with a pattern you like, just export the file and import it into you DAW. Drumbit also includes different reverb options, along with several drum sets -- rock, funk, hip hop and bossa nova -- and the demo beats can even be used as a metronome for guitar or instrument practice. This is probably the easiest tool for beginners to learn programming patterns. Drum Machine (online) is by OneMotion -- an app and online entertainment developer. They offer 14 different drum sounds, and patterns can be made on the simple sequencing grid. Don't forget there are 8 screens to toggle through, by toggling over on the bottom right corner. Beat makers have the option to use it as a virtual drummer on an iPhone or for triggering drum pads with a tablet. Similar vibe to Drumbit, and equally fun. 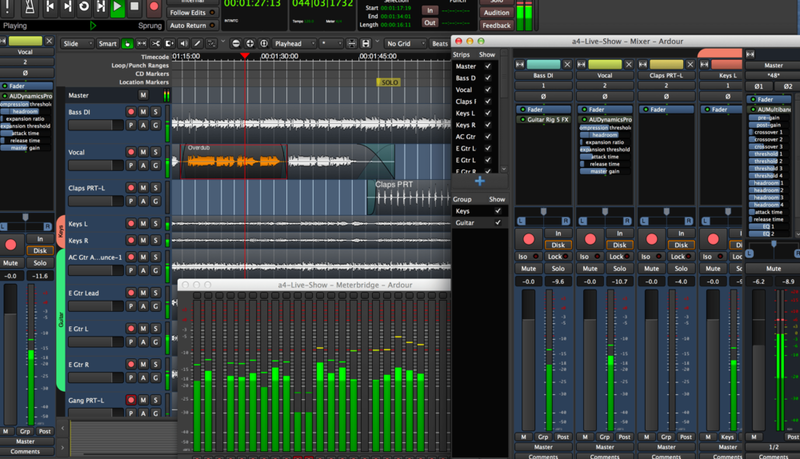 Ardour is a great option to record, mix, and edit music across all platforms -- Mac Os, Windows, and Linux. It is free open source software for audio and MIDI, making Ardour a favorite choice to learn multi-track recording and editing. Any affordable USB or firewire audio interface hardware can be used (like the Focusrite Scarlett Solo). In-the-box plugins, routing, automation, and VST options are similar to the same you find in Logic, Pro Tools, etc. Simply put, beat makers and producers can make a lot of great music with this free audio recording software.